The Furniture Classics 40-56 Chevron Chest of Drawers is available in Hickory Park's, North Carolina Furniture Galleries. Hickory Park may be restricted from showing prices, however please select the Click For Quote button and Hickory Park Sales and Design Staff will reply or please call (828) 322-4440 for more information. 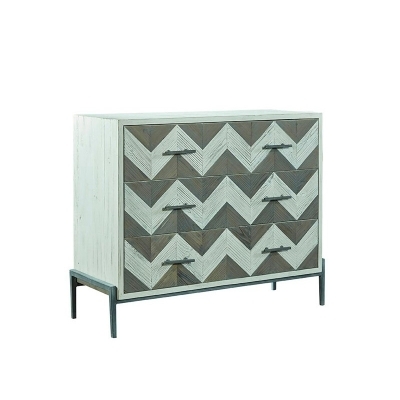 Recycled pine is laid up in a chevron design, and then detailed with a soft white and mid tone grey finish to make the pattern pop Additional interest is provided by a surprising teal interior The sleek chest rests on a metal base making it appear to float, and simple grey bar pulls complete the fashion forward look. A handsome and graphically interesting addition for any room! Click here to receive price quote for Chest of Drawers 40-56 item.